Eversave has a great deal! 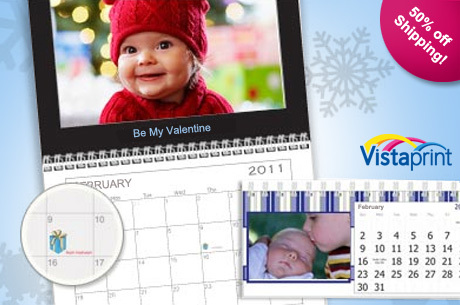 You can buy a Vistaprint calendar for only $1 with 50% off shipping. Shipping starts at $2.84. So, you can get a personalized calendar (these make great gifts!) for as little as $3.84!! With this Eversave you also get 30% off any additional items you add to your order and there is free shipping on orders of $20. If you stock up on personalized gifts, you can get a great deal. You have just over 2 days to purchase this save, so hurry! The save expires 4/16/11.